Did you learn to sew as a child? I did! I had the great fortune to be in a 4-H club, and my leader taught me to sew. My mom taught me a lot, too, and loves to remind me of the countless seams she had me take out to do over. I've wanted to teach my girls to sew, but wasn't sure where to start. 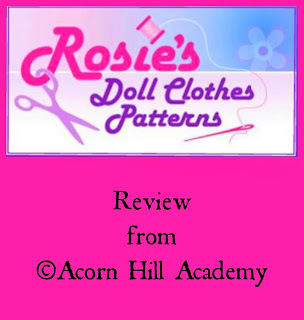 I was delighted to have the opportunity to review Rosie's Doll Clothes Patterns! For this review, I received a 12-month online subscription to her sewing program. The nice thing about these patterns is that you print them at home with your printer. No tissue paper pattern pieces - woo hoo! The pieces are simple to cut out, too, which is great for beginning sewers. The written instructions are nice, but you really need to watch the videos to understand what to do fully. I *love* having the videos. We watched some more than once, making sure we understood the instructions. Rosie has a lovely, cheerful voice with an Australian accent, and we enjoyed listening to her. While we were sewing, if we couldn't remember exactly what to do, we just went back to the video. Actually, I was the one going back to the videos. The girls caught on quickly and were instructing *me. * That's a little embarrassing to admit! Each week, there are videos to watch that teach you about everything from the basics of fabric (woven vs. knit, nap, one-directional fabric, etc.) all the way through elastic and even puff sleeves! Every doll needs at least one dress with puff sleeves, don't you think? In addition to teaching basic sewing skills, Rosie shares great tips that are specific to doll clothes, as well, such as sewing hems first. have you ever tried to sew the hem on the sleeve of a doll's dress after you sewed the sleeve? It's not fun. The patterns are a great way to practice the skills you learn from the videos. The first pattern, Sport Shorts, is quite simple, and is a nice, quick project to get your feet wet and build confidence - simple seams, waistband with elastic, and hemming. Then, when you sew the crop top, you build on those skills with top stitching, and a garment that goes together in a really nifty way. Although I know how to sew, and have made doll clothes before, I learned a lot from Rosie's videos. Also, she taught everything in such a way that it seemed simple and clear to the girls, who picked right up on sewing. She teaches everything in a sequential manner so that you avoid a lot of frustration. For example, I don't think I would have remembered to tell the girls that you should watch the guide lines on the needle plate of the sewing machine so that you sew in a straight line, rather than watching the needle go up and down. I would have assumed they would just do that, when in reality, they had never used a sewing machine before and would not have known. Things like that saved a great deal of frustration and seam ripping. I also learned about some new-to-me sewing tools, such as the loop turner and the bodkin. Rosie taught me, too, that rotary cutters can be used for cutting out all kinds of pattern pieces, and not just straight lines! My 12 year old jumped right in and had a great time sewing. She is the one who would show me how things worked when I had an issue (usually from trying to figure things out without watching the video or reading the instructions carefully enough), and would say "No, Mom, it goes like this." My 13 year old was less excited about trying something new, and resisted a little, until she saw how easy it was. Once she completed her shorts, she was having a good time, and she loved how the crop top came together! It really is an ingenious pattern, but not difficult at all to sew. Unfortunately, we had a lot of sewing machine issues, so we didn't get as far as we'd hoped in sewing our doll clothes. However, we each completed a pair of shorts and a crop top, and we're looking forward to working through the rest of the patterns. 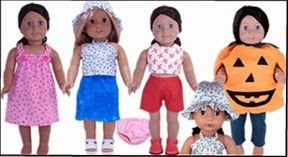 We're going to sew lots of clothes for my little nieces' American Girl dolls for Christmas, so keep an eye out for pictures! Rosie's online video course is available through her website for $47.46 (It's $49.94 AUD, since she's in Australia, and the price could fluctuate slightly with the exchange rates). She's also offering a special from now through December 24, 2013: if you purchase her program, she will include an extra pattern of your choice for FREE! That brings the total number of patterns you get up to 9. 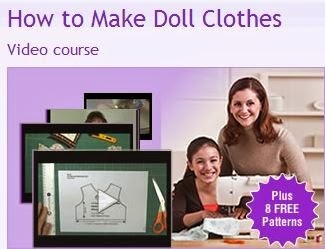 What a great gift idea for that special girl who wants to learn to sew! That outfit turned out great!